The 5x5 MS005MAA provides 5 separately controlled 0 to 5kV outputs, at up to 300mA. Each one can be configured by the factory as positive or negative (combinations of polarity are possible e.g. 3 positive and 2 negative). Each channel is controlled by its own 0 to +10V control signal, and each has its own 0 to +10V monitor output. 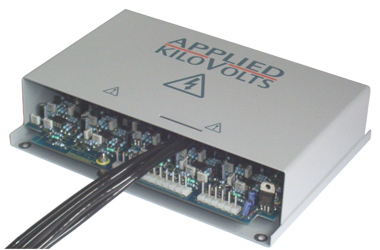 The module is powered from 24V DC, and draws 2 Amps fully loaded. 24 volt d.c. ±5% at 2A. Negative input terminal common to HV earth return. 20V to 5kV at 300uA. As output 1. All outputs are individually controlled. Each channnel can be factory set either positive or negative (combinations such as 3 positive & 2 negative are possible). 0 to +10V gives 0 to 5kV. 0 to +10V represents 0 to 5 kV (all 5 outputs). Less than 150mV peak to peak on each output. Less than 50ppm for 1V change in input. Better than 2% of control voltage. Better than 200ppm per °C. Molex 6 way & 12 way connectors.